Where to park our car? The car parks have been occuppied by the shopkeeper! Majlis Perbandaran Padawan (MPP) has been seen as in-effective when enforce the regulations under their jurisdiction especially to the shopkeepers that using 5 foot walk path or the car park infront of their shops to display their merchandise . This is rampant especially to the shopkeepers in Kota Sentosa or Mile 7th town. Where to park? Cant MPP work harder to enforce the laws before it was too late! MPP enforcement division should walk extra miles to enforce the law. Even the selling of the fire crackers at 5th foot walk path infront of the gambling outlets illegally is also rampant especially during the main festivals! MPP Wake-up before it was too late! The police used of water canon and tear gas to disperse a peaceful protest in Kuala Lumpur was seen as the excessive used of force by many. SUHAKAM should in initiate an inquiry to acertain whether wether the used of water canon and tear gas was justify to disperse the peaceful crowd. The owners of the premises and business in Kuala Lumpur that affected by the protest should sue the police. Please see the full report here. KUALA LUMPUR, Malaysia -- Dozens of people, including a minor and a senior opposition politician, remained in custody Sunday after Malaysian police violently put down a mass street protest against a law that allows for indefinite detention without trial. Opposition activists say the government's high-handed response underscores their concerns that Prime Minister Najib Razak will not fulfill his promises to protect civil liberties. 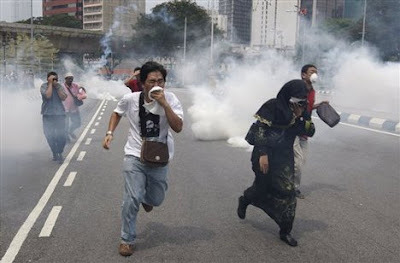 Police used tear gas and chemical-laced water Saturday to disperse an estimated 20,000 people in downtown Kuala Lumpur who were protesting the nation's Internal Security Act. Almost 600 people were arrested in the protest, the country's biggest in nearly two years. Most of them were released, but 39 remained in custody late Sunday, said opposition lawyer Latheefa Koya. Kuala Lumpur police Chief Muhammad Sabtu Osman said those held were being investigated for illegal assembly - an offense punishable by up to a year in prison and a fine. He reportedly said protest organizers, including opposition leader Anwar Ibrahim, would also be questioned. Police had declared the planned protest by opposition groups as illegal. Koya said those still in police custody included a senior opposition politician and the 16-year-old son of a terror suspect detained without trial for eight years under the security law. The politician and others are expected to be charged in court Monday, she said. Two other minors, aged 13 and 17, were released Sunday. "It is clear that nothing has changed in this country," Anwar said in a posting on his blog Sunday. "Whenever there is a peaceful assembly, the police are used by the elite powers ... to prevent the people from expressing their views." Government leaders have dismissed the protest as an attempt by the opposition to gain political mileage. Najib said the protest was "unnecessary and only caused hardship to the people" as the government had already pledged to review the controversial law. But analysts said the police action was a step back for Najib, who has been battling efforts by opposition parties to portray him as a leader who disregards public opinion on issues such as human rights and freedom of expression. He has been struggling since taking office in April to revive his government's popularity amid public dissatisfaction over economic mismanagement and racial tensions. Ramon Navaratnam, chairman for the independent Center for Public Policy Studies think tank, said the crackdown showed that the government had failed to learn the lessons from a poor showing in general elections last year when it lost its traditional two-thirds parliamentary majority. "(Najib) has said the right things but it's not materializing sufficiently.... Is he serious about it - to be liberal and reformist?" Navaratnam said. Ibrahim Suffian, director of independent research firm Merdeka Center, also said the opposition had managed to wrest back some of the spotlight. "Najib is trying very hard to show that he is concerned about reform," he said adding that the crackdown will be a boost for the opposition's claims that Najib won't tolerate dissent. Saturday's protest was the biggest since November 2007 when tens of thousands of ethnic Indians demonstrated against perceived discrimination of their minority community. Human rights activists have held numerous smaller protests over the years against the Internal Security Act, claiming it has been used in the past to jail hundreds of government critics. They say at least 17 people are being held under the law, mainly for alleged links to militants and document forgery. Since taking office, Najib has released 26 detainees, including five leaders of the ethnic Indian protest.